March 28, 2018 April 19, 2019 - The 'Noms. A perfect cocktail for an Easter brunch! 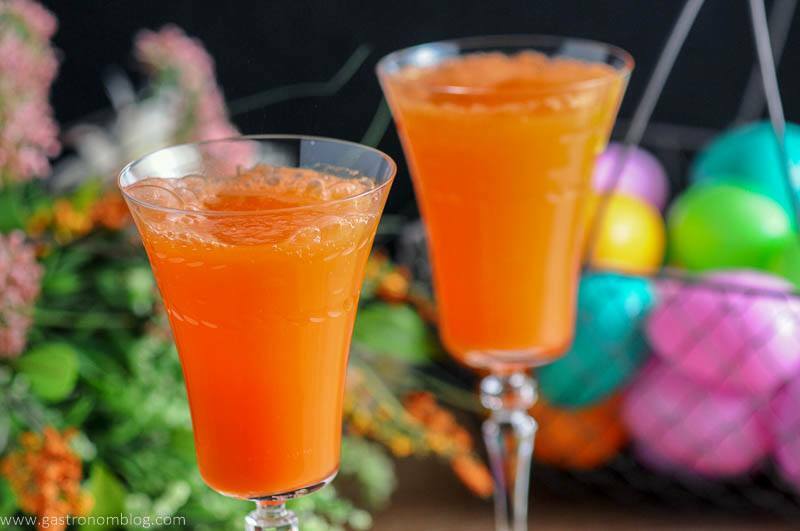 This carrot ginger mimosa cocktail will be great for celebrating the holiday! One request we always are asked about in the spring is if we have a cocktail that would be good for Easter. An Easter Cocktail has to be something a little unique, right? Since unlike some other holidays, Easter isn’t a day known for its big parties. We wanted to combine carrot and ginger, so we made sure to use a ginger liqueur along with the champagne! Easter is however known as a day when there is an extravagant brunch with friends and family. Since brunch is really an excuse to have a cocktail or two in the morning, coming up with a cocktail that we could serve at an Easter brunch seemed like a fine idea! 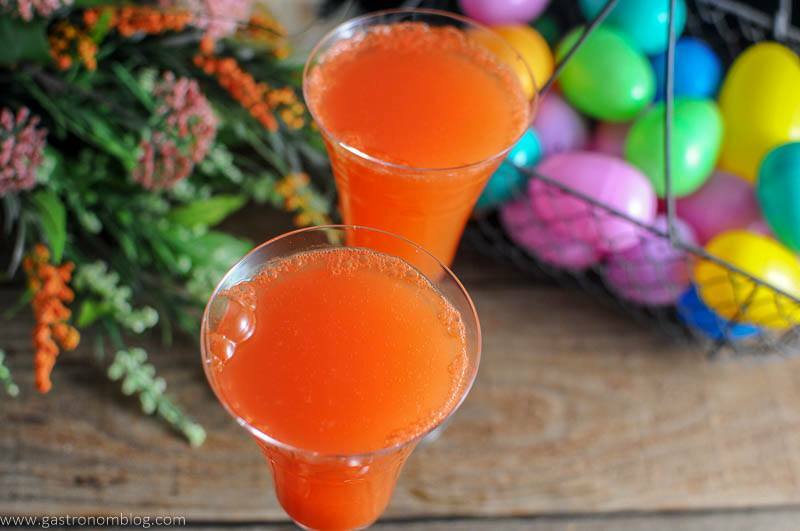 With just a quick little hippity hop, the Carrot Ginger Mimosa became our Easter cocktail! 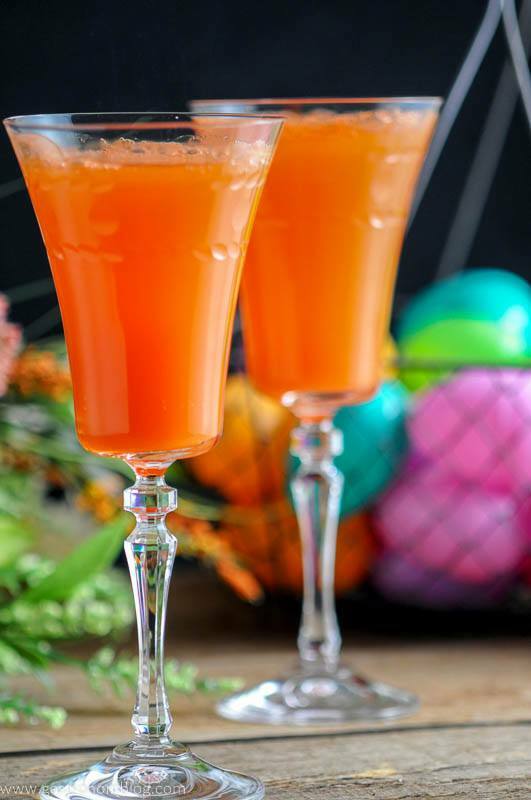 If you want another great Easter Cocktail, check out our Funny Bunny! So What Is the Perfect Cocktail for Easter? When we started thinking about making an Easter cocktail, we wanted something that would definitely bring a little Easter flavor. Also, since making an Easter egg flavored cocktail didn’t really sound that great, we went with another flavor out of the Easter Bunny’s basket, carrots! While not typically thought of as a traditional cocktail ingredient, the carrot is one of those ingredients that can surprise you with how well it can work in a drink! 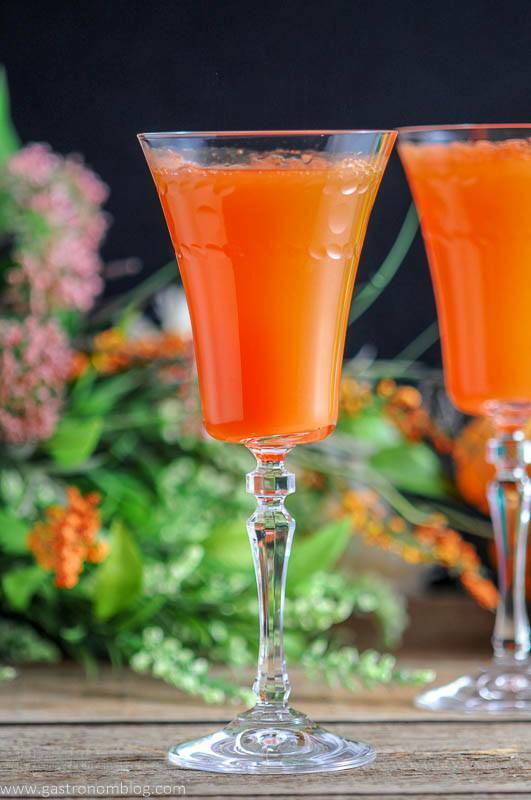 A bit savory and a bit sweet, carrots also add a really beautiful and striking color to your cocktail glass! With the key ingredient to this Easter cocktail figured out, we decided that we had to make a version of what might be the quintessential brunch cocktail, the mimosa. Mimosas are a favorite, typically a combination of sparkling wine or champagne and chilled citrus juice. This combination makes a sweet and refreshing cocktail that is perfect for sipping on at a brunch. 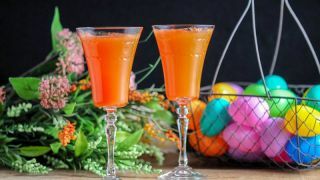 With the basic mimosa as inspiration, we decided that making a mimosa with carrots might make for a very special Easter cocktail! The first thing that a carrot cocktail needs is of course carrot juice, and while you could just go to the store and buy it, that carrot juice isn’t going to be as tasty as fresh carrot juice. And just how do you juice a carrot? Carrots aren’t the easiest things to juice if you don’t have a juicer, but if you have a blender or food processor, you can do the job with just an extra step or two! How do I juice a carrot? 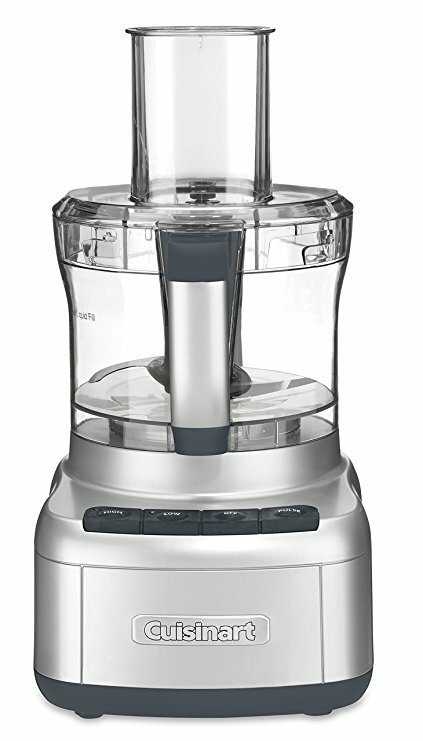 First off, we peeled a few carrots and then cut them into carrot coins and placed them into our food processor with some cold water. Then we pureed the carrots until finely chopped and then placed the carrot puree into a cheese cloth in a bowl with a colander and allow the carrot juice filter through the cheese cloth into a bowl. 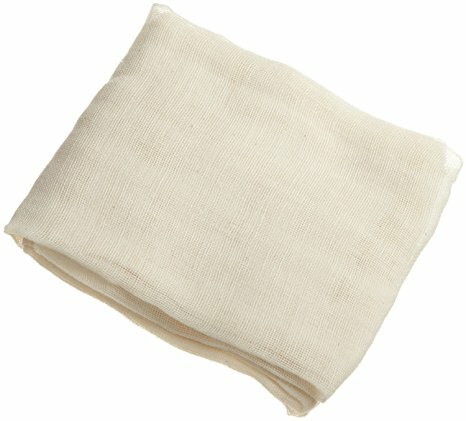 To get the full flavor of the juice, compress the carrot containing cheesecloth by giving it a good squeeze. This was to get the last bits of juice, and voila, carrot juice! This carrot juice is fresh and bright orange and ready to use in your cocktail! What flavors go well with Carrot? We wanted a way to bring a little citrus flavor into the Carrot Ginger Mimosa, so we went with one of our favorite syrups, a spiced orange syrup that we used in our Earl of Orange cocktail. It combines some of the tart citrus brightness of orange zest and fresh squeezed orange juice with the warm spice flavors of cinnamon, clove and star anise. The spiced orange syrup brings just the right amount of sweetness to help brighten up the carrot juice. Plus, it tasted great along side the earthy sweetness of the carrot juice. 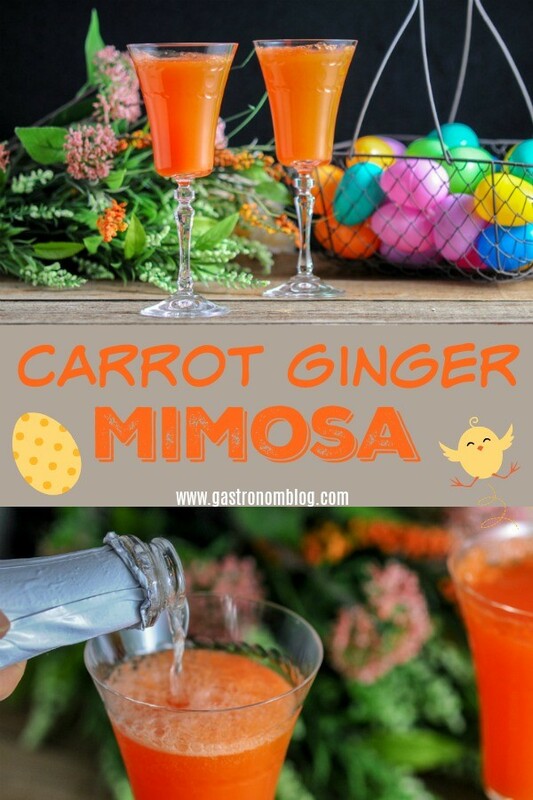 What Ingredients are Needed for the Carrot Ginger Mimosa? We also wanted to add a little something to add a little bite to this cocktail and help balance out the sweetness. The sweetness being the syrup, sparkling wine and the carrot juice. A little splash of ginger liqueur adds a spicy bite while also complimenting the the warm spices found in the orange spiced syrup. Carrots and ginger are great pairs (ever notice how things that grow similarly taste really good together?) and the combination of ginger liqueur, citrus syrup and carrots made for a good drink by itself! Of course a mimosa isn’t a mimosa unless you have a fizzy component like champagne or sparkling wine to bring a refreshing bubbly side to this brunch favorite. 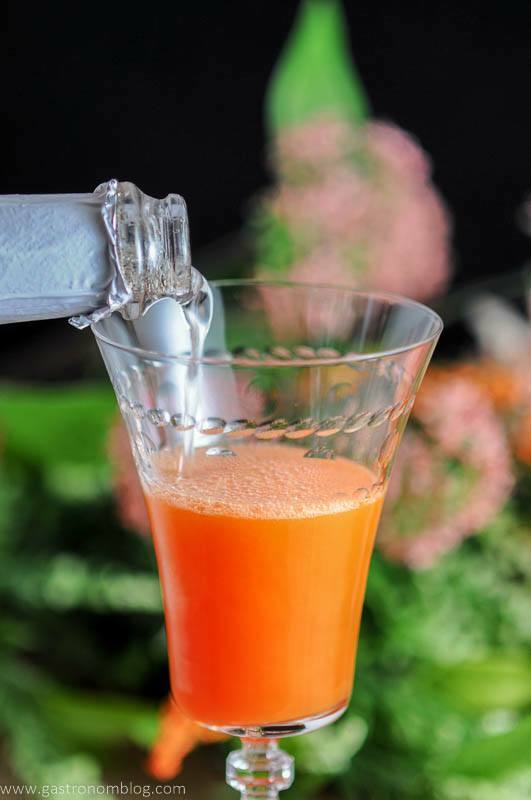 We didn’t want our Carrot Ginger Mimosa to get overly sweet, so we chose a nice brut champagne which has a nice dry finish that keeps everything in balance. The champagne also has enough acidity to add a nice pleasant brightness while the bubbles bring a refreshing crispness to the whole cocktail. We served the Carrot Ginger Mimosa nicely chilled in some beautiful cocktail coupes. You can totally serve it in a Collin’s glass or champagne flute. All these glass styles lets the bubbles rise while highlighting the beautiful rich orange color from the carrot juice. 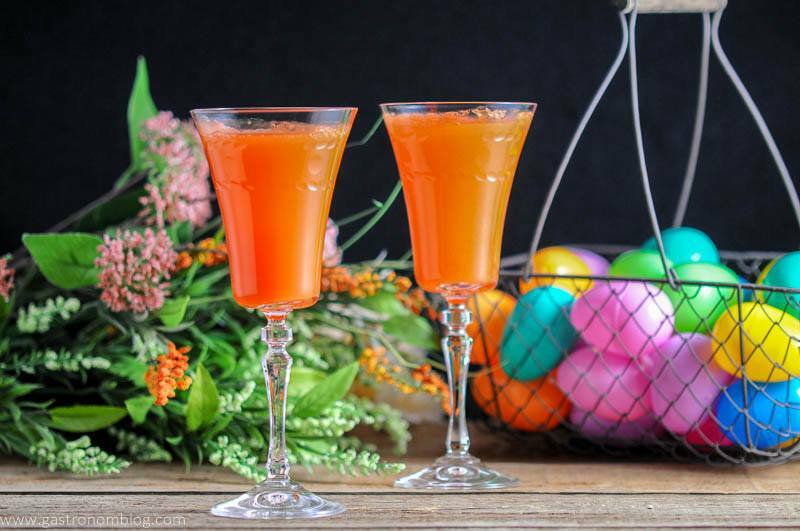 The rich orange color and bright fresh flavor of the Carrot Ginger Mimosa is sure to add a little treat to your Easter Brunch! If you want another Holiday ginger cocktail try our Holiday Ginger Flip! Or, if you want a great brunch cocktail try our Spicy Bloody Mary! 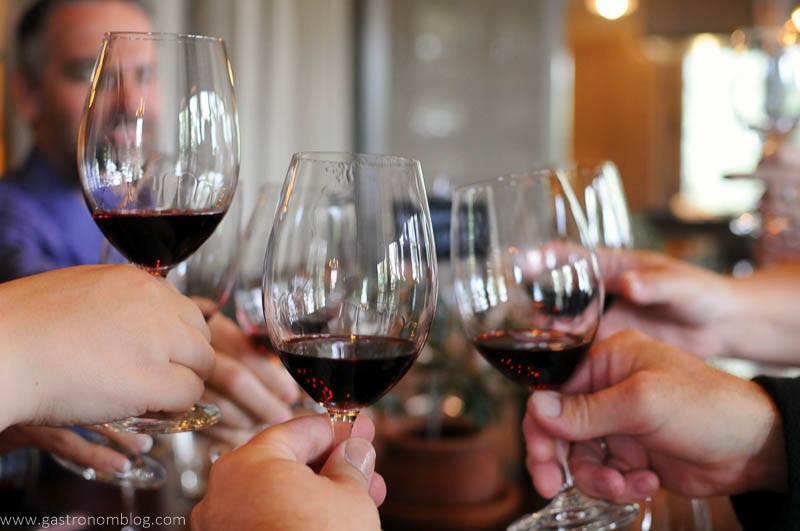 Napa is Open and Needs You! A perfect Easter and spring brunch cocktail. Bubbly and fresh with carrot juice and ginger flavors. Place carrot coins into a blender or food processor and chop up slightly. Slowly add in water until it resembles coarse, wet sand. Add in the rest of the water and blend up. 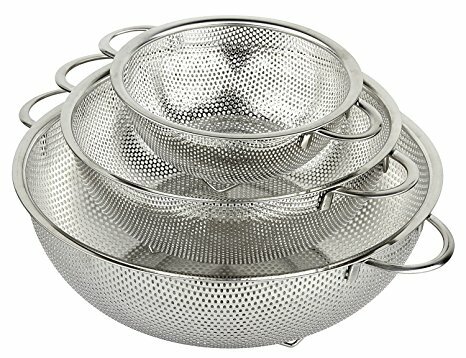 Place in a cheesecloth in a colander placed inside a large bowl. Let sit for 20 minutes or so, then squeeze out the rest of the juice, discarding the solids. 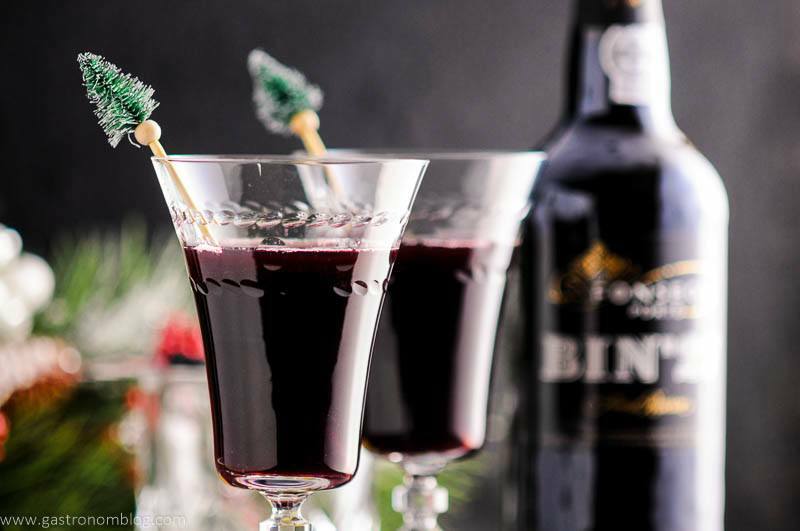 Combine simple syrup, ginger liqueur and carrot juice in the bottom of a coupe or tall glass. 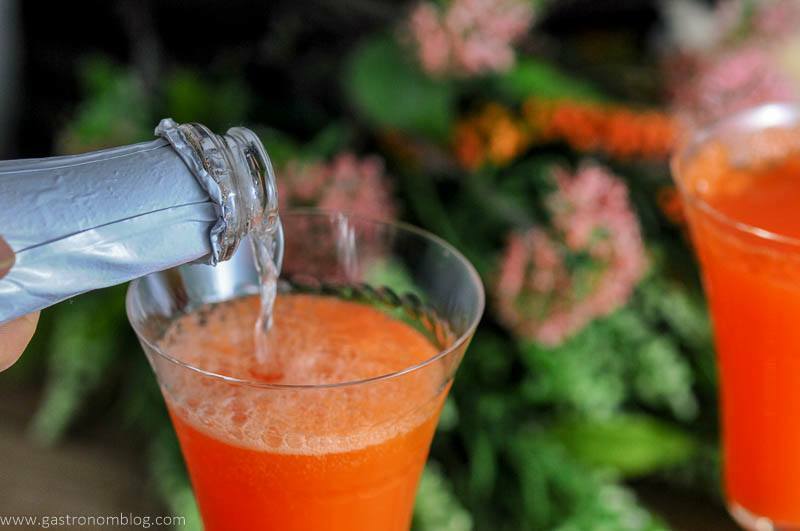 PIN THIS CARROT GINGER MIMOSA RECIPE FOR LATER! Thank you so much! 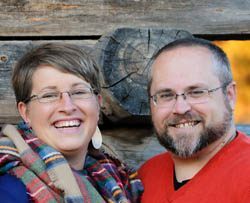 We loved this one, and hope you do too! Cheers! The color of this mimosa is gorgeous! Definitely the perfect Easter cocktail! I had no idea they make ginger liqueur, I need to try that for sure! This is so unique and brilliant! What a perfect drink for Easter and spring in general (and summer too). Nothing like a refreshing and delicious mimosa for brunch. Love the bright color too! Thanks so much, we thought it was a great spring cocktail! Cheers! This is so interesting. I have always thought the sweetness of carrots go great with the freshness of ginger. I never thought I would see this in a cocktail. Nice! Thanks so much! We had fun with this one, cheers! These are so fun and perfect for Easter! The color is just beautiful! Thanks so much! The color is so vibrant! First of all – genius! Carrot mimosa? Sign me up! I’m going to hop with joy on the way to the bar! Second – thank you for your suggestions on how to make carrot juice without a juicer. I don’t have a juicer but I have a food processor so I could totally do that! Yes! We wanted to make it as easy as we could, so this was it. Hope you try it out, cheers! It’s been a really long time since I’ve had carrot juice! This sounds so delicious- and how perfect for spring! I actually just bought a bunch of carrots- I need this! Yes! Such a great flavor, and it makes such a great cocktail! Cheers! I’ve been following your carrot cocktails on Instagram and have been loving them! They’re all so gorgeously vibrant looking, and I love that this one is paired with ginger liqueur. How fun will these be for brunches all spring! Thank you so much! I cann’t wait to have them all again next year!